Well, we had a visit from Fire Marshall Bill today. He walked into one of our storage rooms and said "WELL LET ME SHOW YA SOMETHIN!" Those boxes are to close to the ceiling. What's in them? We all looked at each other and said "I dunno." Let's find out shall we. What it turned out to be was a HUGE stash of old vinyl records from one of our classic/album rock stations. Within all of those boxes. I found a few boxes of Christmas music. Andy Williams was apparently very popular. But the biggest fond for me was this. That's right. The Signing Mailmen of Miami. Reminding us to Mail early and have a Merry Christmas. From the USPS Postal Museum website. 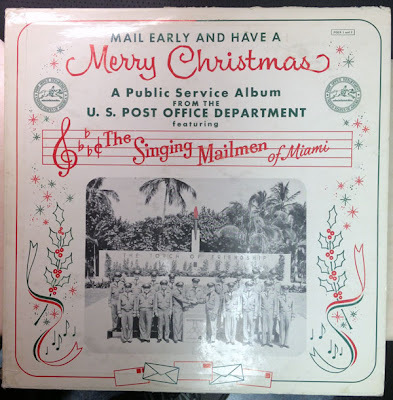 In the 1950s and 60s, a group of postal workers from the Miami Branch area joined together as the Singing Mailmen of Miami and were later adopted as a voice of the Post Office Department. Twenty-five letter carriers and clerks organized in 1954 as a non-profit nondenominational glee club. (1) A letter to a local Miami newspaper stated “We are not a fanatic group, but this we do believe: where others have failed, music has opened the heaviest doors and left peace, good will, and understanding”. (2) This letter emphasizes the Singing Mailmen of Miami’s main intent: good will, a desire for which brought together the group of diverse postal workers (thirteen letter carriers, five clerks, two supers). Each performance was completed by a performance by the “JCP Trio,” composed of a Jew, a Catholic, and a Protestant who would remind the audience of the importance of brotherhood. At their beginning the group was purely for the enjoyment of each other’s company and the chance to sing. But as time passed, they began to sing at post office events, local events, and nursing homes. By 1960 they had garnered national interest and the Post Office Department adopted them as their official spokes-group. Their fame continued to grow as they released an album entitled “Neither Snow Nor Rain,” the money from which came their funds for the ZIP Code tour. 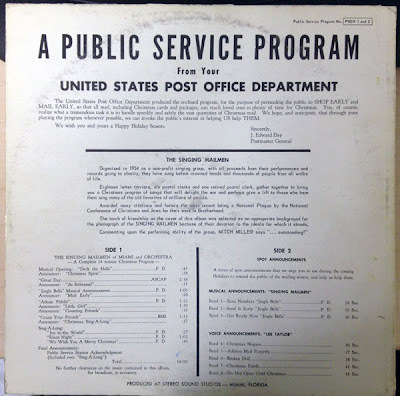 They even became popular enough to be featured on the prime-time television program “Sing Along with Mitch” where they sang their theme song, “Men with the US Mail.” They were also the only organization at the time to be granted special permission by the Postmaster General to perform in their uniforms, which they declared as “a great honor”. (3) Other notable performances were at the White House, the U.S. Congress, and for Florida Governor Ferris Bryant. Christmas stamps, Christmas stamps, making our debut. We’ll brighten up your Christmas cards and speed them on to you. Don’t delay; mail today. It’s later than you think. Now here is the fun part. I work in a place where we actually have record players and some nice equipment to record things. I will be digitizing the album for delivery to my readers for the Christmas/Holiday season. So when the time comes. I will be doing something fun with this. So is anyone interested. An inquiring mind wants to know. Singing mailmen....why not? I'd love to hear them sing Christmas carols. I am definitely interested. Christmas and mail, two of my favorite things. My ears are excited to hear the singing mailmen. What a very cool find. I started recording it tonight. The best parts for me are the psa stuff. The 30 second spots for radio. This is dating pre zip codes. Such a great discovery, Derrick. Me being a mail freak, count me in! SO interested! That is awesome! that is absolutely amazing! what a score. and I'm a total sucker for old PSAs. This sounds totally amazing. Singing mailmen... how cute is that?